At Outsource2india we understand the importance of a single transaction in the real estate industry. It is not uncommon that a lucrative deal is lost only because the client is unsure of the look-and-feel of the interiors once furnished. In this scenario, virtual staging can be used effectively in real estate industry by giving them a virtual feel through digitally furnished units. Outsource2india is a leading virtual staging services provider based out of India, and has the requisite infrastructure, expertise, and resources to meet any virtual staging requirements. We use the newest 3-dimensional rendering technologies to effectively render realistic physical dimensions of a property. 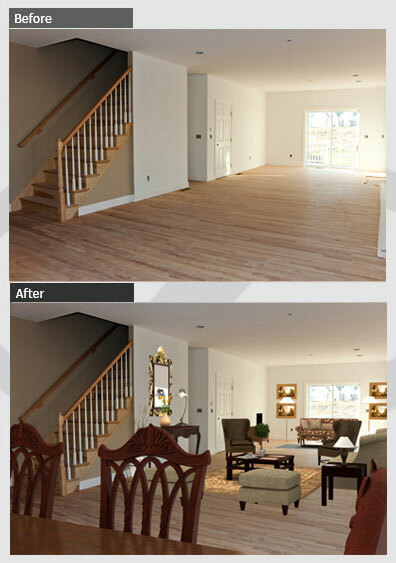 Provide Photorealistic-Quality Images - Our virtual home staging service makes it simpler and helps portray real estate images attractively to prospects, and yield positive results for both sellers and buyers. Render Realistic Housing Interiors - To find prospective buyers and ensure successful real estate deals, showcasing images of houses with furnished interiors is essential which Outsource2india handles. Display Cohesive Designs - By virtual staging, effort, time and revenue is saved because real estate property can be visualized exactly the way it has been planned. Help buyers visualize their personal choice - At Outsource2india, real estate sellers can simply express their need and we will be able to furnish the property using custom furniture and embellishment available with us. Define Accurate Sizing and Placements - At Outsource2india our editing experts, can transform a simple photo of an empty room into a fully furnished home for prospective customers with proper defined angles, lighting, shapes, textures, colors, proportions and placements. Why Choose O2I for Virtual Real Estate Staging Services? Sell real estate faster - Staged homes sell faster and for higher value than vacant real estate which takes longer. Most sellers face difficulty in visualizing the potential of an empty home and now with our virtual home staging service, it is made simpler! Read the article which explains how virtual reality is transforming the real estate selling. Outsource2india helps minimize effort, time and cost by using latest 3D rendering technologies effectively. We use the latest and advanced 3D rendering technology to ensure realistic images for customers. Our team of 3D experts has the ability to translate real estate sellers' requirements into realistic images which enhances a sale. In fact, we can create 3D furniture models based on customer inputs and we also have our own catalog of furniture which customers can choose from. Opt for our virtual staging services today, and spark customer imagination as soon as they land into the real estate store or website. We, at Outsource2india will be glad to assist. To take it a step further, we can provide customers with a 360° virtual tour. Find out more about our Real Estate 360 Degree Virtual Tours. Just imagine the satisfaction of a prospective customer when breathtaking interiors of a real estate property are displayed.